Renowned guitarist and recording legend Steve Vai has picked British Audio Engineering (BAE) mic-pre's and EQ for his demanding stage and studio needs. After extensive testing and auditioning ten of the top products available today, Vai remarked, "BAE is the clear winner, simply stunning -- kind of magical." In 1999, BAE carved out a premium niche in the vintage Neve/API market as the first company to remanufacture the 1073 mic-pre/equalizer since its discontinuation by Neve in the 70s. After years of repurposing and racking up mic-pre's and EQ from classic Neve and API consoles, BAE now faithfully recreates new versions using original sources, including Jensen transformers, Carnhill transformers, and Elma gold-plated switches from Switzerland. To decide on BAE's new 1073, Steve Vai did a comparison with the original, a modern day circuit board replica, and BAE's new unit. "BAE has the smoothest and most responsive EQ I have ever heard," he commented. "It just adds a beautiful air and is clearly superior. I tested the mic-pre's without any EQ and they come back fat, round and warm. The edges aren't too sharp and for the guitar that is so important. You can EQ for days with this BAE gear and it just brings the sound to life. It's like every day is Christmas." "It's all discrete and completely hand-wired," explains Mark Loughman (pronounced Lofman), who after serving as chief engineer for many years is now CEO and owner of BAE. "The original Neve 1073 mic-pre/EQs are known as the Holy Grail of outboard gear, but manufacturing was discontinued in the 70s. Eventually that supply has dried up, so we have gone to the original component suppliers to continue the legacy." 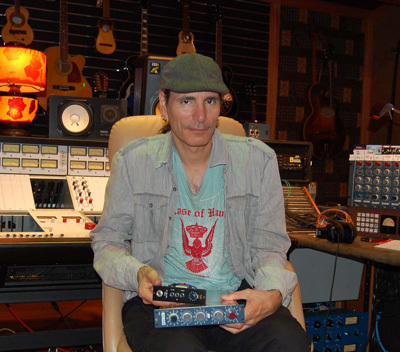 BAE Gear: Steve Vai is an avid user of the BAE 1073 and 1028.